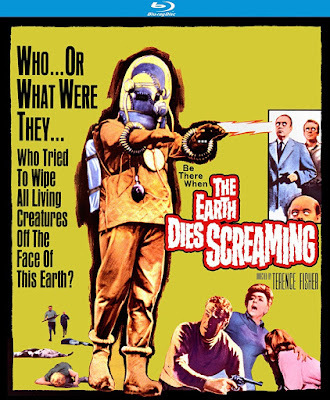 Rupert Pupkin Speaks: Kino Lorber Studio Classics - THE UNDYING MONSTER, THE EARTH DIES SCREAMING and CHOSEN SURVIVORS on Blu-ray ""
Some cinephiles may not be aware of director John Brahm, but let me just say that he is a solid chap. If you've not had a chance to check out his films HANGOVER SQUARE or THE LODGER (which he did better than Hitchcock), do seek them out forthwith. Both are dark and moody gothic tales told well. I was lucky enough to catch a double bill of the two films at L.A.'s Egyptian Theater some years back and it was one of the best doubles I've ever seen there. Sadly, I let Brahm slip off my radar for a while, but am glad he's resurfaced in the for of this new Blu-ray from Kino Lorber. 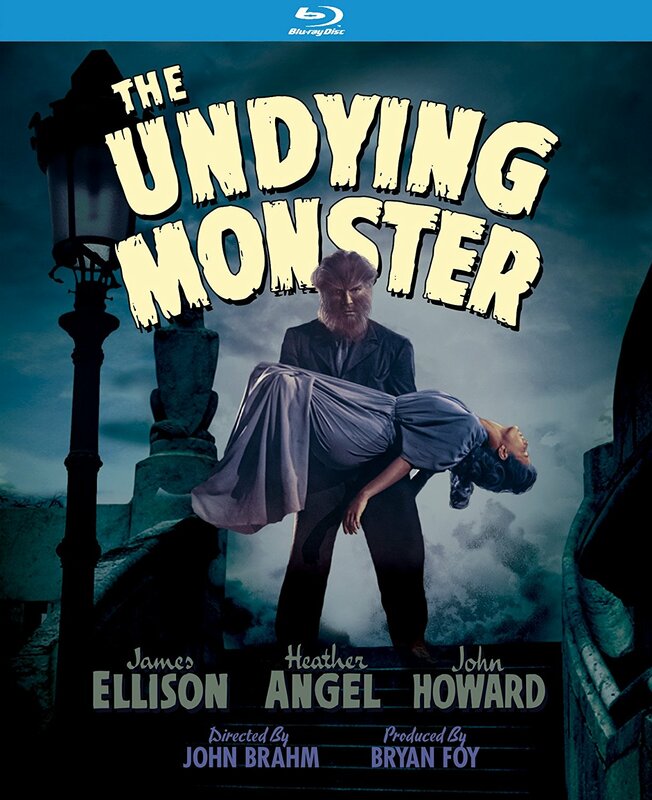 Part wolf man monster story and part old dark house murder mystery, THE UNDYING MONSTER clocks in at a breezy sixty-three minutes. Despite its poster image, the film focuses the majority of its running time on procedural aspects and the investigation of a mysterious attack on two people. The brother and sister have lived in their family manor their whole lives and it has something of a curse about it. There is even a placard which warns of going out on nights when the moon is full and there is frost on the ground. One of them makes that mistake at the beginning of the film and ends up mauled, while the woman he was escorting is left in a coma after the animalistic assault. Scotland Yard is called in and they are determined to solve the mystery - which seems to be leaning towards a supernatural explanation. 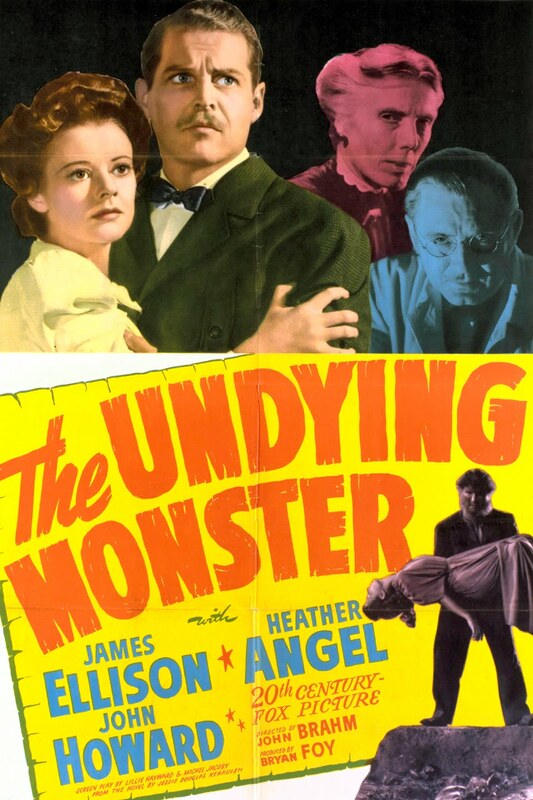 The monster is sadly (spoiler) not seen until about the last ten minutes or so, but the impression he makes is a good one and the transformation is not bad for 1942. The movie has fun aspects though, from several shifty characters who clearly know more than they are letting on to a secret basement crypt in the house which adds an even more to the Universal horror milieux. So the only thing you have to come to terms with is that there isn't much monster in the movie and that the whole thing is more whodunnit than creature feature and you'll be fine. It's still a well made slow burn so that when the monster finally dies appear, it is ultimately a nice payoff to a solid build. Fans of THE WOLFMAN and other Universal classics (with more than a dash of Sherlock Holmes) will likely find this worthwhile and should grab it when they can. It feels very much like a film trying to cash in on the success of universal and does so suitably well. It even held my seven-year-old daughter's attention (and that's saying something) - even though she's a big SCOOBY-DOO fan and that likely informed her enjoyment of the picture. -NEW Audio Commentary by Film Historian Tom Weaver, with Sumishta Brahm, David Schecter, and Dr. Robert J. Kiss. As this movie opens, we're treated to train, plane and car crashes as people generally collapse for some unknown reason. There are people lying dead in the streets everywhere and it is an eerie sight. It's a particularly memorable way to start a picture as it poses the question, "What the hell is happening?" and takes a bit to fully answer that. Next we see a man driving through a small village in a Range Rover. At first you wonder if he knows what's happened and how he will react when he finds out. It becomes clear he knows something is up (& doesn't much care) when he steals a radio from the display window of a shop in the village. As he sees the bodies strewn about the road, he reacts very little. Immediately I'm hooked. End of the world-y stuff with a lone dude riding around? Very OMEGA MAN-ish and I love the setup. 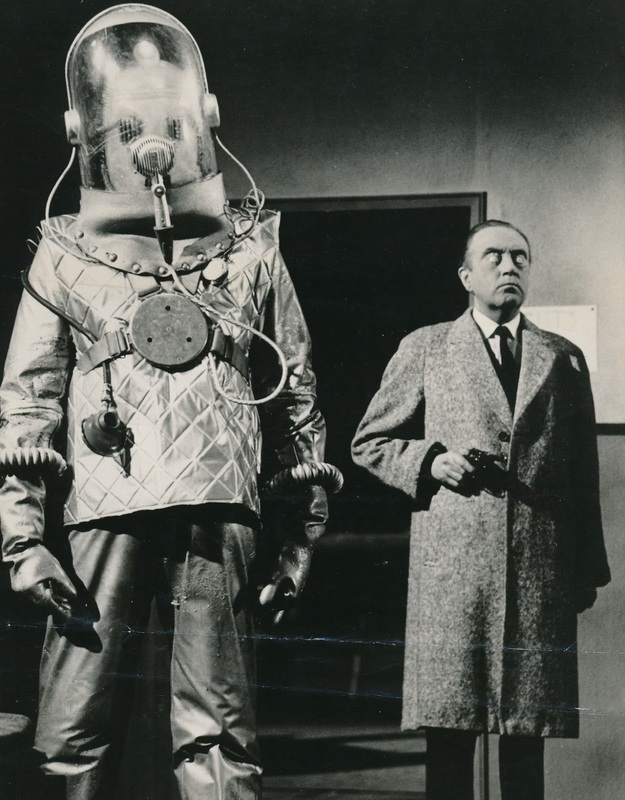 It's a Twilight Zone-y scenario if I've ever seen one and this kind of contained science fiction is totally my bag. 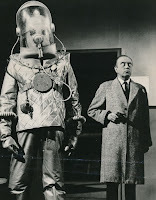 The movie is short too (just over an hour) so it adds to TWZ/OUTER LIMITS feel. The whole feels like something that might have helped inspire one of my favorite "last people on earth" movies of the 1980s - NIGHT OF THE COMET. Since it came out when it did, it could even have been an influence on George A. Romero and NIGHT OF THE LIVING DEAD. 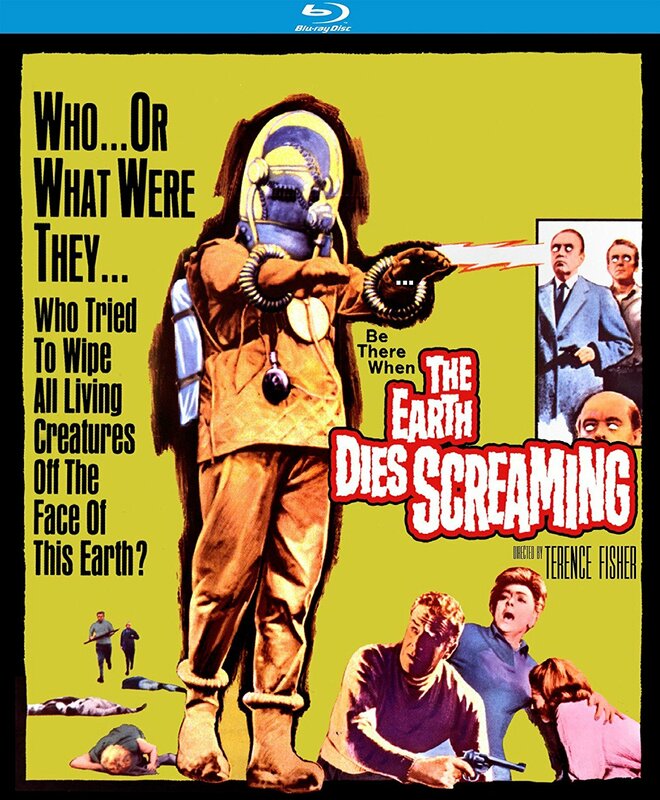 Hammer Horror veteran Terence Fisher (HORROR OF DRACULA, THE DEVIL RIDES OUT, THE MUMMY, CURSE OF FRANKENSTEIN) directs this film. More post-apocalyptic madness is thrust on the viewer in this one as we see a small group of men and women thrown groggily into a bunker that lies some 1,758 feet beneath the ground. Think of it as a forced BIO-DOME kinda thing, but tho group is expected to repopulate the earth after the radiation clears from the global nuclear holocaust that has just gone down. If BIO-DOME is the comic DR. STRANGELOVE version of a story like this, then CHOSEN SURVIVORS is the serious FAIL SAFE version of the story. Wait, no that doesn't quite work, but you get the idea. This movie is not only quite dire, but it also veers into horror-y territory when the survivors discover that they are not alone down in the bowels of the earth. Richard Jaekel is there too - and we all know how he can be. 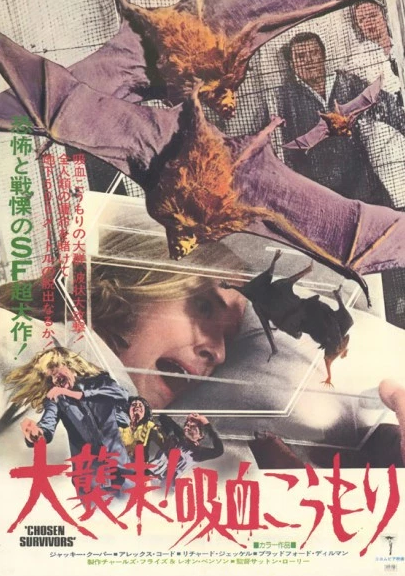 Oh and they've got bats. Vampire bats. That's kinda the last thing you'd wanna deal with in an enclosed space so the group is understandably dismayed and tension mounts quickly. The film stars Jackie Cooper, Bradford Dillman, Alex Cord and others. 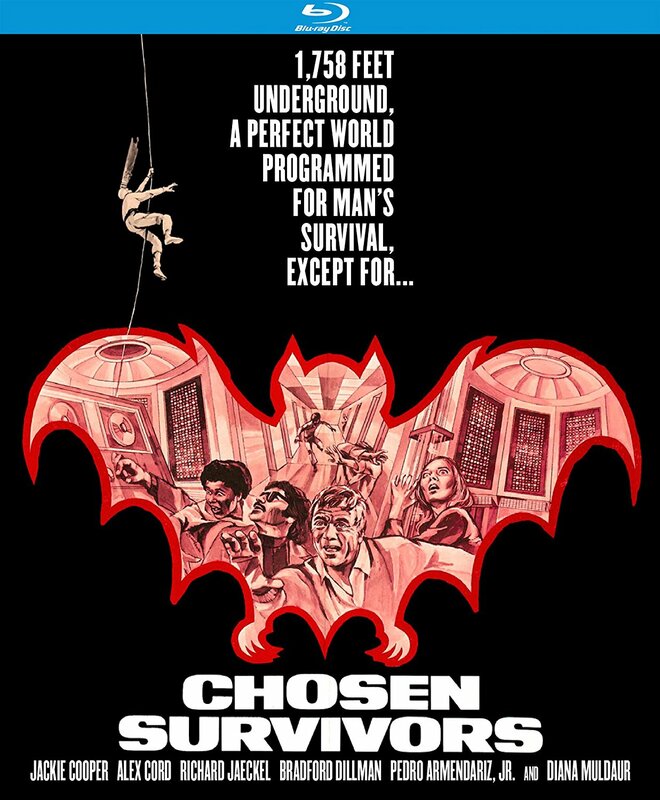 CHOSEN SURVIVORS is a bit grim, but oddly resonant in some ways right now - especially the general idea of the whole thing. From their underground lair, the group can see the world burning up in a nuclear fire (via satellite pictures) and those images alone are quite haunting and not like too many things I've seen in other movies. Also, the bunker in which the people are being housed is a very interesting quasi-futuristic place with a feel that is a bit like a stainless steel Starship Enterprise or the room at the end of 2001. Neat production design overall, despite the fact that the movie gets pretty depressing and uncomfortable in spots.